Saturday, June 2, 2018 ~ 10:00 a.m.
Friday, June 1, 2018 ~ 5:00 – 7:00 p.m.
LaVaughn R. Hanson, 84 of Ashland passed away Tuesday, May 29, 2018 at her home. 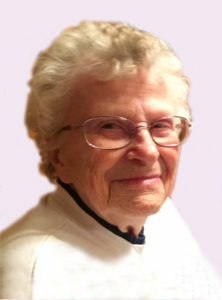 She was born March 11, 1934 in Ashland to Roy and Cora (Wills) Edstrom. When LaVaughn was five years old, her father passed away and she was raised by Earl and May Adcock of Ashland. She attended Ashland High School. LaVaughn was united in marriage to Daryl Hanson on June 14, 1952, five children were born from this union. She was a loving wife, mother and grandmother. She worked at the Dairy Cone in Ashland for 19 years and she loved working with the kids and meeting new people. LaVaughn is survived by her children, Dale (Katy) Hanson, Jenel (Maury) Rogers, Steven (Tonya) Hanson all of Ashland; grandchildren, Christy, Tessa, Tanner, Sami Jo, Shawn, Jerame, James, Travis, Tonya, Shane, Cara, Michelle and 30 great-grandchildren; brothers-in-law, Larry Hanson of Waverly, IA, Don (Darlene) Hanson of Wahoo. She was preceded in death by her husband, Daryl Hanson, sons, Leigh and Dean Hanson; grandsons, Justin and Harley; three sisters, Verna, Carlene and Carolyn. To Steven and family, she was a very strong, sweet, and so funny. She will be missed by all that knew her. When she was here she did a great job raising a family and being a wife. She was the monarch of the family, she wasn’t very big and she didn’t talk real loud but she was strong in way people only here knew about. She was so very sweet and caring about others. I’m so glad I knew her. Deepest sympathies to my cousins. LaVaughn was a very special lady. My first memory of LaVaughn dates back to before she married Cousin Daryl. Hard to think I won’t see her again in this life. Sympathies to all who loved her. My prayers are with the Hanson family. LaVaughn is a wonderful women. Sorry for your Loss,LaVaughn was a very sweet and kind women.May your memories bring you Comfort and Peace.